← 455 "Postcards from the Wedge"
A rain cloud moves over a crop field behind the Simpsons' house, it rains, the cloud leaves and various fruits grow out of the ground the Simpson family (all except Homer) are bugs and sit on the largest fruit, Homer, as a Snail pops out of the fruit. "He's dead! I love him! Oh, he's breathing. Loser!" "Stealing First Base" is the fifteenth episode of season 21. It originally aired on March 21, 2010. It guest stars Angela Bassett and Sarah Silverman. "When Springfield Elementary's two fourth grade classes have to share desks rather than pay for a substitute teacher, Bart falls for his new deskmate, but after he kisses her, she starts sending him mixed signals. 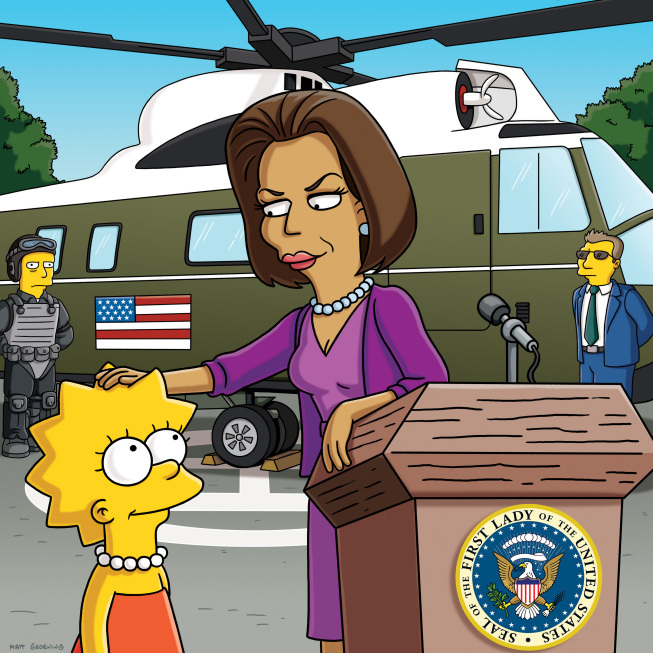 Lisa gets advice on how to handle being a female overachiever from Michelle Obama." Bart's fourth grade class is merged with another fourth grade class when Edna Krabappel is absent. Their teacher is Miss Audrey McConnell. In the crowded classroom, Bart is forced to sit by a new student named Nikki. At first they dislike each other, until Nikki admires Bart's artistic skills. Bart seeks romance advice from Homer, who passes him off to Grampa. Grampa advises Bart to kiss Nikki. However, when Bart kisses Nikki after the two went skateboarding, she recoils in disgust. Nikki's parents, who are attorneys, threaten to sue the school unless it is declared an "affection-free environment." Bart is confused at the outcome of this seemingly innocent action, and his confusion is amplified when Nikki hides in his locker and kisses him again. Bart and Nikki have been watching this speech from the roof, and Bart confesses to Nikki that he does not understand her ever-changing moods. They argue and Bart stumbles and falls off the roof. Bart is not breathing, but the school's "no touch" policy prevents anyone from performing CPR. Nikki defies the policy and revives Bart (who, while unconscious, dreams a montage of kisses reminiscent of Cinema Paradiso). When Bart awakes, Nikki's mood changes yet again and Bart remains in a state of complete confusion over female behavior. Then the policy is banned. Meanwhile, Lisa becomes more popular when she receives an F on a test, but becomes unpopular again when it is revealed that she was given the failing grade by mistake. She blogs about being ostracized as an overachiever, and her post is noted by a mysterious blogger known as FLOTUS1. FLOTUS1 ("First Lady of the United States 1") turns out to be First Lady Michelle Obama, who drops by Springfield Elementary to give a speech about the importance of academics and recommends that the students be nice to Lisa and other overachievers, including Martin Prince, Jr. and Allison Taylor. Throughout the episode, Nelson Muntz has befriended a blind boy and teaches him how to laugh at the misfortunes of others. At the end, the blind boy tricks Nelson into believing that a punch he sustained after insulting Nelson restored his sight. When he reveals this to be a prank and laughs Nelson's signature "haw haw," Nelson tearfully states that the student has become the master. Modified on July 16, 2017, at 02:56.